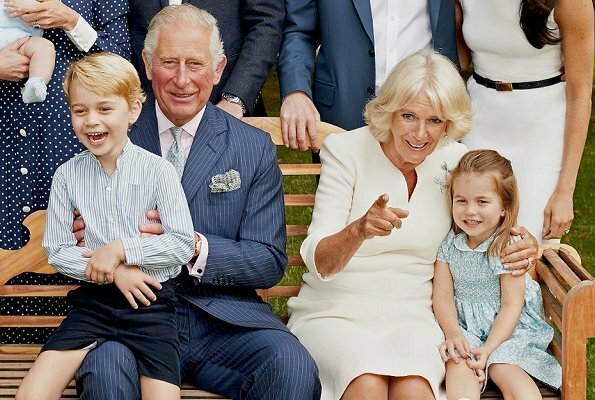 Two new photographs of The Prince of Wales and his family have been released to celebrate HRH’s 70th birthday. The photos feature The Prince of Wales, Duchess of Cornwall, the Duke and Duchess of Cambridge, with their three children Prince George, Princess Charlotte, and Prince Louis, and the Duke and Duchess of Sussex. 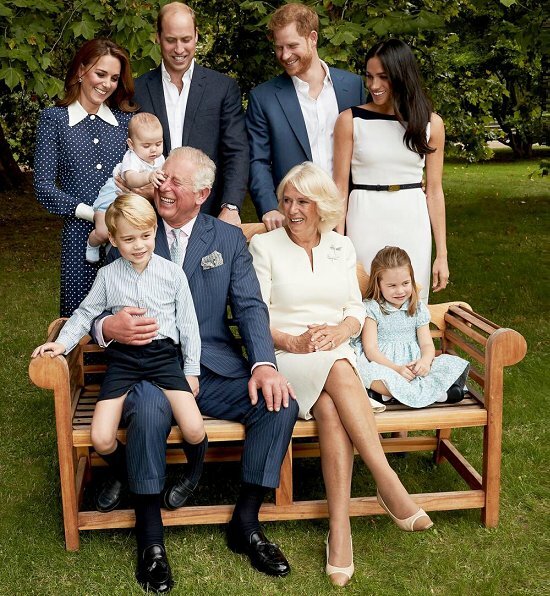 The photos were taken by Chris Jackson in the garden of Clarence House. Wow. Wonderful photos. Photos of Prince Louis at last. 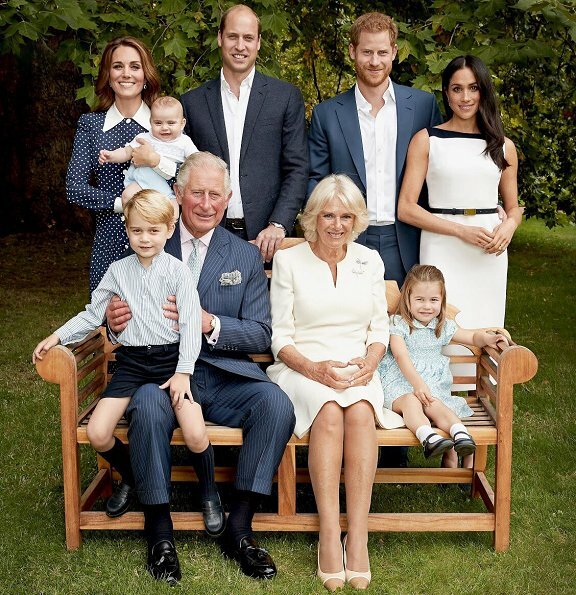 Great to see the children all smiling together, George sometimes looks a bit solemn. I love the last photo where everyone is laughing. I think it is one of the best I have seen of Meghan, who sometimes looked very 'staged' in photos (this is not a criticism--we know she was an actress and is used to smiling for the cameras) She's just lovely in this photos. The dresses of all three ladies are nice without being amazing. Mustn't forget the birthday boy. Congratulations on your milestone birthday, Prince Charles. Have a great day. Agree with you. Happy and unforgettable birthday Charles! Lovely photos of a lovely family! I especially like the one where they are distracted and laughing and pointing to something on the side. Those kind of candid photos are the best. Happy Birthday to Prince Charles. Well said, I totally agree. Happy Birthday to Prince Charles. Great family photos! Very natural. Catherine looks fantastic! Wonderful photos! 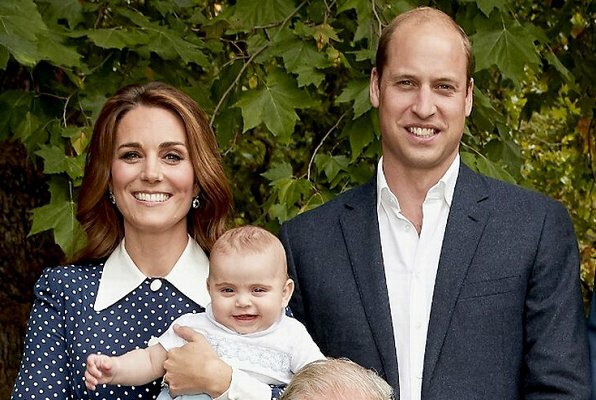 What an interesting little face Prince Louis has--he has his own look and does not strongly resemble his siblings. Love Meghan's easy, elegant dress and the blue theme of everyone's outfits. Charlotte has charisma and a mischievous confidence--still looks strongly like her Great Grandmother. Prince Louis to me seems the spitting image of his maternal grandfather, Michael Middleton. There's not (yet) so much Windsor-Mountbatten about him. No, I think he is more like Spencer s.
Lovely family portrait. Seeing the family so relaxed is a genuine treat! Nice and warm photo. They all looks happy together. Lovely pictures, two of the best ever maybe of the Wales family. Agree with this opinion - best ever pics of the Wales family and there is still potential. Lovely photos of the family together. Love Catherine's dress. At the moment it looks like Louis is more Middleton than Windsor. Kate looks like a nanny in this dress. No offense but it was my first thought when a saw the pictures. Her make up and hair are beautiful. it's funny how we see the same thing and have completely opposite opinions :-) To me her make up ages her, a lot, and I am not sure the lighter highlights in her hair (which, by the way, is the first time I see, not noticed them before or after this photo) do her any favors. Charlotte needs a new dress and shoes! Wonderful family shots, so lovely! They all look sooo nice! Especially the pic where they are laughing, joy and happiness! To me little Luis takes a lot after GanGan Elizabeth but also after Prince Andrew (in the last photo where he is serious), he could be his grandson, haha! As for Charles: It is possible to appreciate his commitment for Environment issues and criticise his behaviour against Diana at the same time. Beautiful photos, and I agree with Pine about little Charlotte and her charisma. I like Catherines "Classic english rose"-appereance and would like to have seen Meghan in a dress with sleeves. Yes, I agree. Catherine looks like the perfect "English rose" and I would have preferred Meghan with sleeves. I think Meghan looks great in the sleeveless dress. She counter balances and provides a fresh contrast to all the sleeves already in the photo; more importantly she has the arms and shoulders to wear that style of dress perfectly. Good on her. Well, I do not think there is any counter balance or fresh contrast needed. this photo was clearly taken in the summer, so when Meghan's pregnancy was at a very early stage (if there at all), hence no "bump"
This is from september, the pregnancy was not visible at that time. What a wonderful family and photo. These photos were taken in the summer, shortly after the wedding. MUY FELIZ CUMPLEAÑOS PRINCIPE CARLOS!! Die Kleinen sind einfach entzückend , wie ihre bezaubernde mum Catherine !! Nice pictures (although I believe they re all staged, including those so called 'spontaneous' ones). 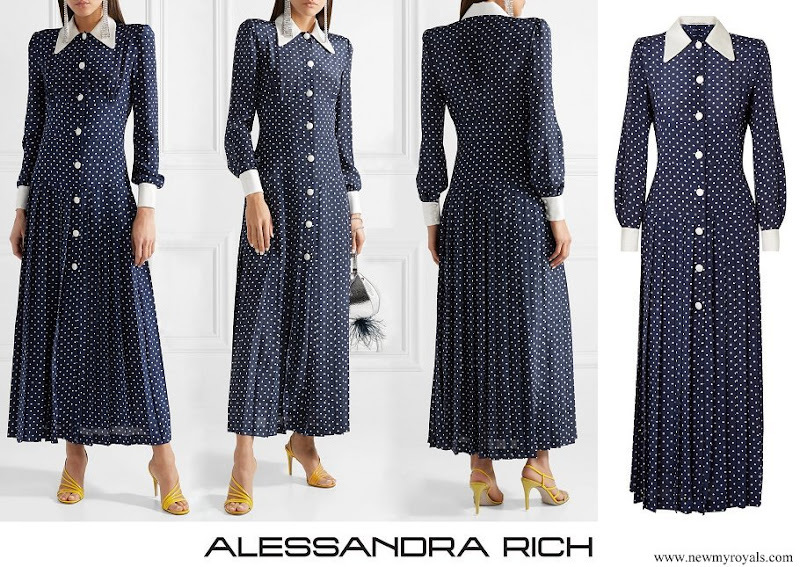 As far as fashion goes, I don't like the Alexandra Rich dress, I know it is trendy - but to me it is just a style that reminds me of Norland Nanny school (albeit a finer version of it). Kate's very long hair isn't doing her any favours (I am aware we have quite a variety of opinions). On the other hand, Megan's dress is Givenchy at its best - I love it's simple, classy, French elegance. Audrey Hepburn written all over it. Camilla indeed looks quite fit (not just her legs, like someone noted above) and seems to have lost some weight and/or gotten fitter. Regardless of our opinions on how much she is at fault in terms of Diana's diveroce and untimely departure, I have to say Camilla has grown on me to the point that I am beyond accepting her. I have come to admire her in many aspects / situations. No one can question her dedication and work ethic. And we are told she is a very nice and warm person. Most important: certainly she makes Charles happy. Speaking of, I wish the Prince of Wales many happy returns of the day. He also has grown on me very much. 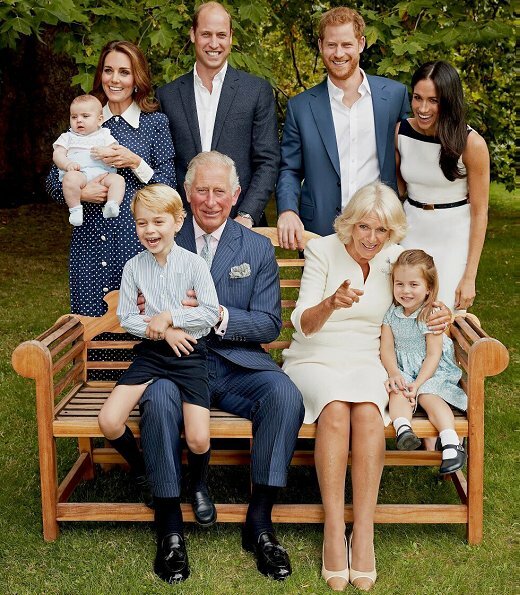 What nice photo,Happy 7ost Birthday to the future King.